Drive Angry, an English movie, is not currently screening in Hyderabad. Endless hacking of limbs. People being nailed to walls. Tons of torn bloodied flesh. Weapons slicing people's heads. Open wounds being impaled. Cars exploding. Half naked girls reeling off dialogues as though in an international "make as many sentences with the F word as you can" contest. And the finishing stroke - the hero (Nicholas Cage) drinking beer from the broken skull of his freshly-butchered adversary. For those who're particular, there's a plot embedded somewhere underneath all that. fullhyd.com has 700,000+ monthly visits. 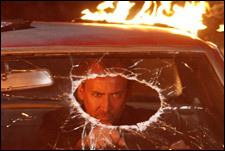 Tell Hyderabad what you feel about Drive Angry, and then also see all user reviews for Drive Angry!